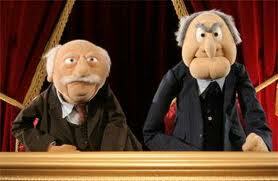 Today, I join my good friends Waldorf and Statler in the peanut gallery to heckle the movie “Gone with the Wind”. Of course my heckling is shallow and flavorless compared to the great masters. So, as I was saying when last we met, I have nothing but praise for the first three hours of Gone with the wind. The acting was superb, the story was brilliant and easy to follow despite the huge cast, and the sets and effects are brilliant considering it was made in the 30’s. It’s hard to describe exactly how this movie grabs the audience, it’s something that is almost impossible to put into words. Then again, I love a challenge! Move over, Mammy, I'll help her with that girdle! Uhm…where was I? Oh right, grabbing…heheh. The movie also grabs you with how well they recreate the era. Everything from the how the character’s talk and move to the architecture of the sets and costumes have all been meticulously crafted to draw you into the 1860’s. As soon as the movie opens to show Scarlett flirting with a couple of young boys, I immediately knew this was the old south and it rendered the opening text exposition redundant (more on this later). It’s a shame really, it’s like the director wasn’t sure they audience would know where the character’s were, but the brilliant part of the movie is that all the carefully crafted dialog tells us where we (the audience)are in an instant. It also tells us who the character’s are just by watching them. 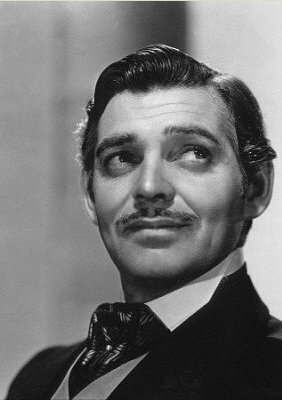 When people in this time frame we’re walking around with beards and mustaches like these, showing up in public with that little fuzz around his upper lip amounts to putting a kick-me sign on your back and challenging people to do it. And then the people are too afraid to try it! That’s how badass this man is and one of the reasons why this movie is so great. The most important reason of all, however, is the honesty that permeates the movie. Mark Twain once said that writers tell lies in order to reveal a truth. The best works of fiction are the kind that create elaborate worlds and characters, that craft people that never existed and places they could never go. We lie to our readers to draw them in, and when we get them to trust us, when they have given themselves over to whatever illusion the writer has created, we suddenly reveal a truth. What that truth is depends on the writer, but it almost always has to do with something everyone can relate to, a simple human truth. Steinbeck’s Of Mice and Men was about loneliness and what it can do to people, more recently Dan Brown’s works often spoke of the paradoxical nature of humanity of wanting to know the truth and our uncanny ability to cling to lies. For Gone with the Wind that truth is about finding our place in society (and by extension fighting for our place in society), wanting to feel safe and, of course, wanting to be loved. These are things we all desire. Rhett, thrown out by parents because of a petty misunderstanding, fights to create a place in the world where he can feel safe. To become rich enough to not care what others think of him, to not be constrained by society’s hypocritical double standards. Scarlett is disenfranchised by the war and does whatever she has to do to make sure she never suffers from hunger, or pain or loss again. And through it all, they try to find someone to love. The movie also deals unflinchingly with topics such as slavery, the horrors of war, and women’s rights. This was shot in 1937-8 and showed in 1939, the 19th amendment (granting women the right to vote) had only been ratified twenty years earlier. I’m sure there were still some morons going around saying women shouldn’t vote, in fact I’m positive there were because we still have idiots today saying that. But actively showing a woman rebelling against a male dominated society, and succeeding, was an exceptionally bold move on the part of the director. Many of the things Scarlett does, talking with prostitutes, owning her own business, being married multiple times, are things that were still unacceptable in the 1940’s. It wasn’t until the 1960’s that the old “housewife” role that women had been forced into finally started to crumble. And speaking of the 60’s (when the civil rights movement really got going), the movie even deals with racial tension and equal rights in a time when state-sanctioned discrimination was still commonplace. Granted it doesn’t get to explore much of these issues, but they are present. So I applaud the screen adaptors and the director and everyone else who made the right choice of airing these controversial issues. I hope you enjoyed that applause because now I’m going to smack each and every one of you for the rest of this article. And you deserve every minute of it because that final hour was the biggest kick in the balls since I groped my chastity-minded ex-girlfriend. But seeing as this post is already turning into a novella it appears I’ll have to divide this into four sections instead of three. Tune in next week for the actual heckling with Statler and Waldorf. Previous PostHow I became a Hyper-Intelligent Super-Brain by playing Videogames.